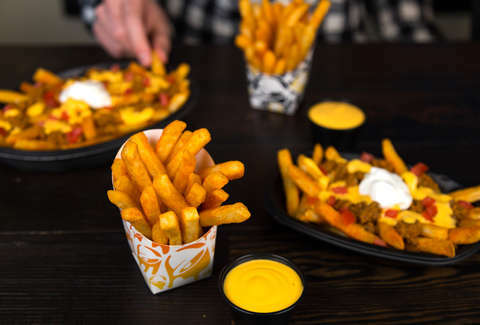 When Taco Bell stopped serving its wildly popular Nacho Fries in April, everyone knew it'd be only a matter of time before the chain's super-seasoned take on the fast food staple returned to its menus. In fact, T-Bell strongly hinted the fries would make a big comeback sometime this summer, and on Wednesday, it said that time has finally come. There's just a slight catch: they're not just $1 anymore. Taco Bell said Nacho Fries are officially coming back to its restaurants across the United States on Thursday, July 12, and just like last time, they'll only be around for a limited time. But unlike last time, it looks like Nacho Fries won't be on the chain's ever-expanding $1 value menu. Instead, adding a side of Nacho Fries to your usual Crunchwrap and burrito orders will set you back $1.29, or almost a third more. Meanwhile, the prices for the loaded Supreme and BellGrande versions will be the same as before at $2.49 and $3.49, respectively, according to a press release. In case you missed them earlier this year, Nacho Fries are exactly as simple as they sound: crispy, seasoned French fries served with a side of warm nacho cheese dipping sauce. They're not your typical fast food fries in the sense that you'll likely end up dipping them in the cheese sauce or some Fire Sauce instead of ketchup. You can also order them as custom ingredients inside your usual tacos, burritos, and other menu items, which is arguably the best way to eat them. Tony Merevick is Senior News Editor at Thrillist and loves fries. Send news tips to news@thrillist.com and follow him on Twitter @tonymerevick.